You could easily be excused for mistaking – as many people do – Erno Goldfinger’s Balfron Tower for its (slightly) taller, and certainly more famous, younger sibling the Trellick Tower. Balfron Tower essentially became Goldfinger’s dry run for West London’s Trellick, and the two share a number of distinctive features. 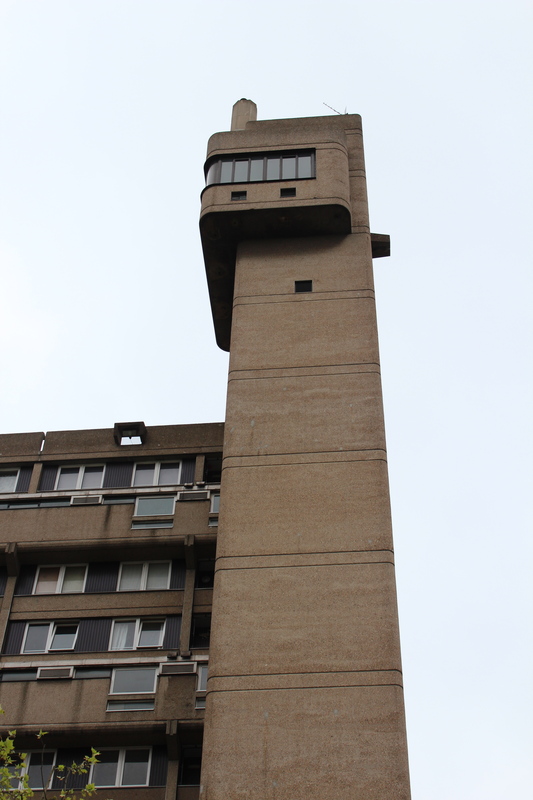 National Trust’s 2 Willow Road, Goldfinger’s Hampstead home, organised a tour to Balfron last week, so the Londonphile headed off to visit another of London’s brutalist gems. 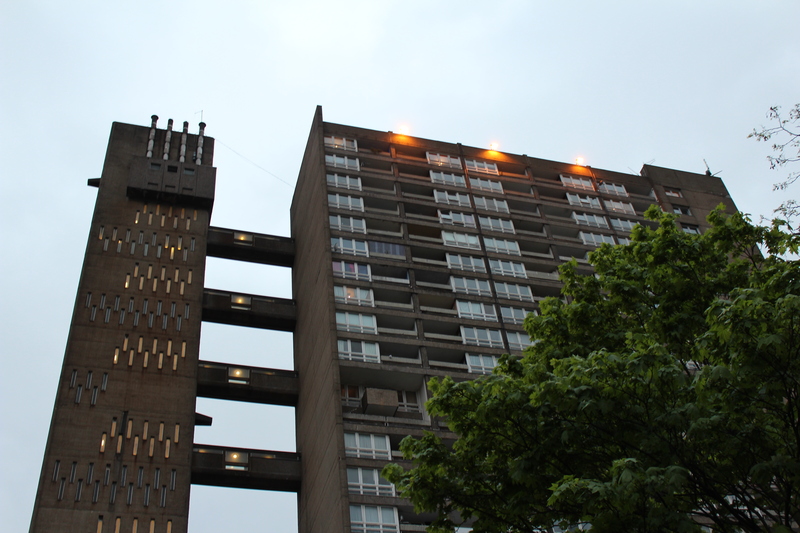 Balfron was Goldfinger’s first foray into large scale social housing. He’d long had a hankering to design taller buildings, and at 27-storeys Balfron must have really hit the spot. So high was it in fact that for years it was exceedingly popular with pirate radio stations and other illicit communicators, who would place radio masts on its rooftop. Designed in 1963 and built between 1965 and 1967, it forms part of the Brownfield Estate in East London’s Poplar. This is something of a Goldfinger fan’s vision of heaven, composed as it is of not one but two of the architect’s buildings (Balfron and Carradale House) and a third (Glenkerry House) designed slightly later by his studio. All three were named after Scottish villages, in what was apparently a homage to the area’s Scottish connections. The long, low form of Carradale House is currently under wraps (quite literally) as it is being refurbished. 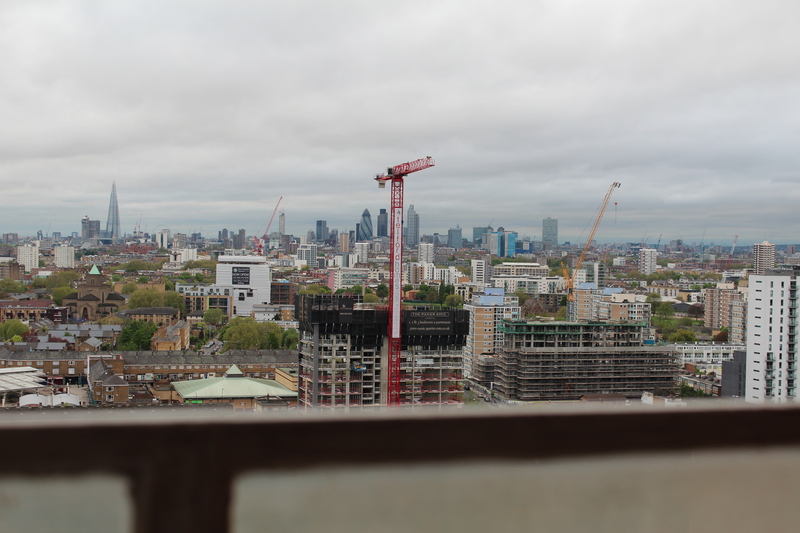 Balfron is about to undergo a similar refurbishment and is currently – and somewhat controversially – slowly being “decanted” of its residents by its management group, Poplar HARCA. In the meantime, a number of artists had been invited to live and work in Balfron. One of these artists, Simon Terrill, also created an installation featuring Balfron Tower – now on show at 2 Willow Road – and organised our visit to flat 122 on the 21st floor, whose former residents had left behind more than a little of the detritus of their lives (in addition to leaving on the heating). Balfron is entered via a concrete bridge – which has been compared to a drawbridge – to the distinctive separate service tower. This detached tower was to become a favourite design element of Goldfinger’s and one which he used again at Carradale (but placed in the middle of the building) and at Trellick (also to one side, but at a 90 degree angle). This service tower contains “all the noisy stuff”, including stairs, rubbish chutes and the two lifts that service the entire structure. 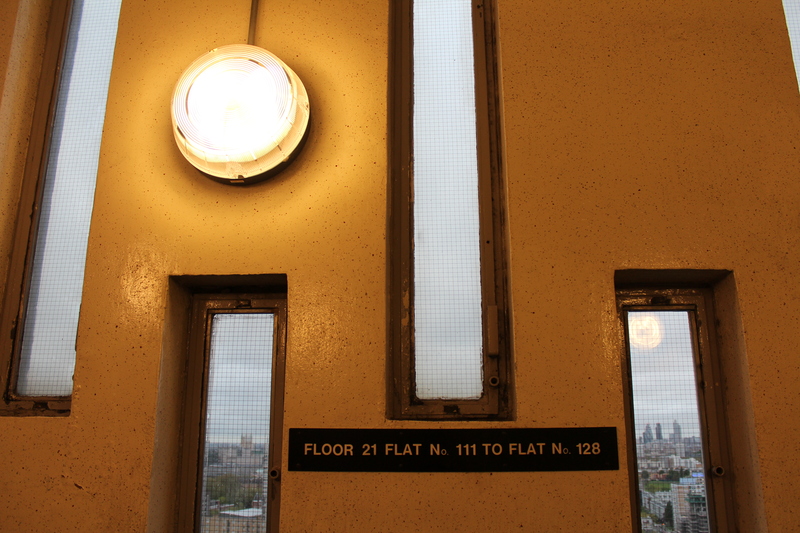 One family were moving out when we visited – item by item in one of these narrow lifts; happily, Goldfinger later included an extra lift when designing Trellick. The boiler room can be seen jutting out at the very top of Balfron’s service tower (with its metal boilers reaching for the sky). 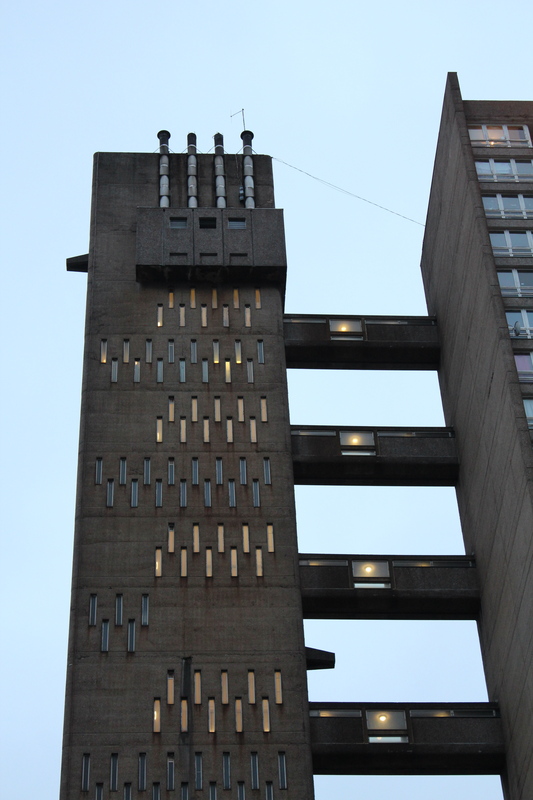 Balfron has often been compared to a fortress and – like its brutalist counterpart the Barbican Estate – contains a number of martial and castle references. The service tower is attached to the main section of the building by seven walkways. This means that lifts do not service each floor, and entry to the flats is via every third floor. So for example, you would travel to the 12th floor to access floors 11, 12 and 13. This feature is also repeated at Carradale and Trellick. The lift foyers contain narrow rectangular windows – which have been likened to arrow slits – that create the interesting pattern on the outside of the tower and afford tantalising glimpses of Balfron’s spectacular views. The flats themselves also have three styles of entry; you might encounter a staircase going up or down immediately upon entering, or you might just enter directly on that level. Those with a staircase down to the flats, like the one we visited, once had a door in one of the bedrooms that led directly to the fire escape (these are now kept locked). Goldfinger and his wife Ursula rather famously left the leafy confines of Hampstead and moved into Balfron for two months in 1968, primarily for Goldfinger to get feedback on his design from other residents and to give it a test run for himself. They even paid rent! They held parties in their flat – number 130 on the 25th floor – during which Goldfinger would ply his neighbours in the sky with champagne while eliciting their views on Balfron. This feedback was then applied to his design for the Trellick Tower. Just one of the superb views – possibly to be encroached upon by the new towers in front. The rooms within the Balfron flats (in number 122 a kitchen, lounge, two bedrooms and bathroom) are quite small and narrow. 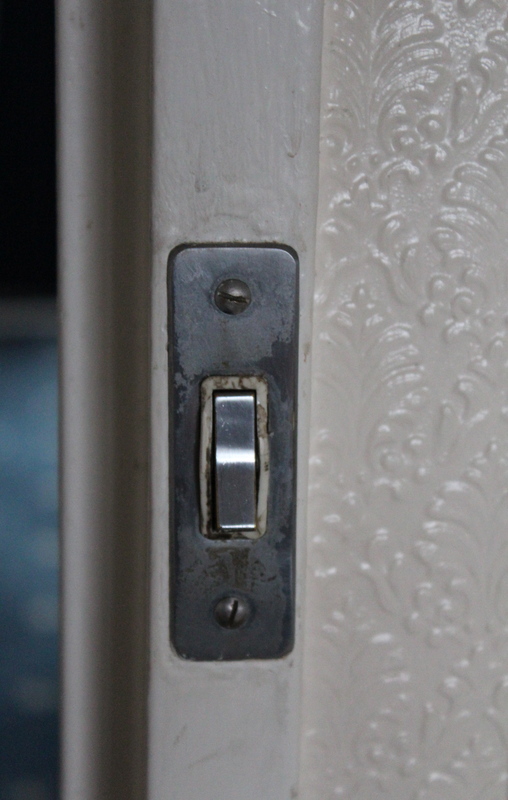 Not many of the original features survive in number 122 – with the exception of the all-metal light switches and the built-in window boxes – making the interior nothing much to write home about. But the beauty of Balfron is in its exterior, which Simon Terrill likened to a sculpture – although beauty is obviously very much the wrong term for this reinforced concrete jungle. Goldfinger’s colleague James Dunnett spoke of “delicate sense of terror” when referring to Balfron, which seems a far better phrase to apply to it. I have turned down some of the heaters, but I think the one in the kitchen is still on. Should you wish to visit Balfron’s exterior the closest station is Langdon Park on the DLR line. 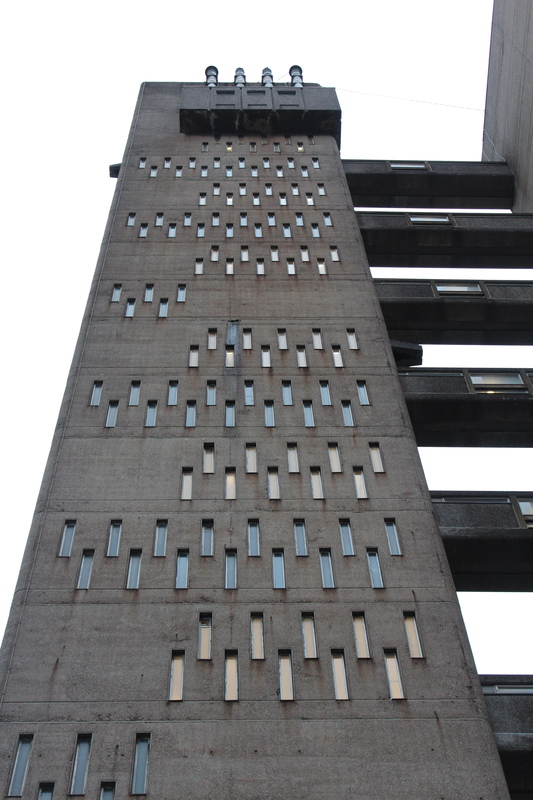 Balfron Tower is often open as part of the Open House Weekend. 2 Willow Road are also holding a series of lates on the last Thursday of each month until October (except August). The 25th October late will feature Simon Terrill talking about his Balfron Project. 6.30-9pm, £9. 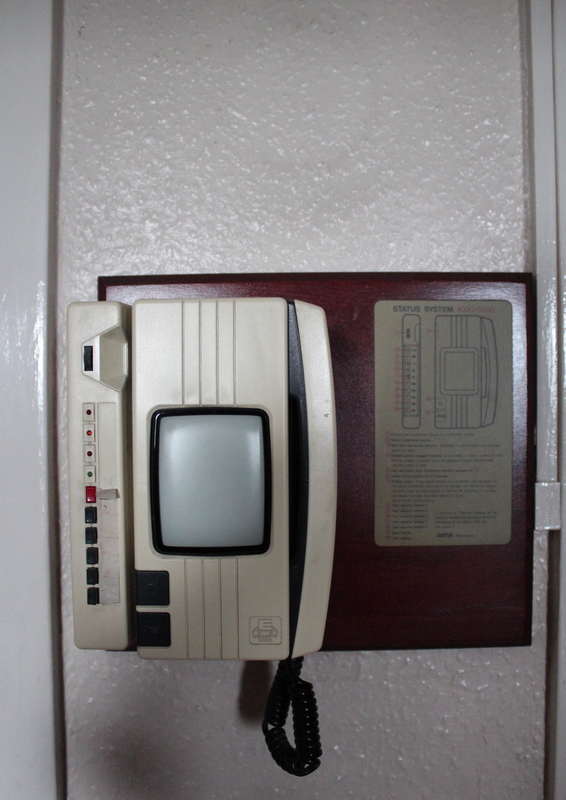 Door entry phone, thought not to be original. 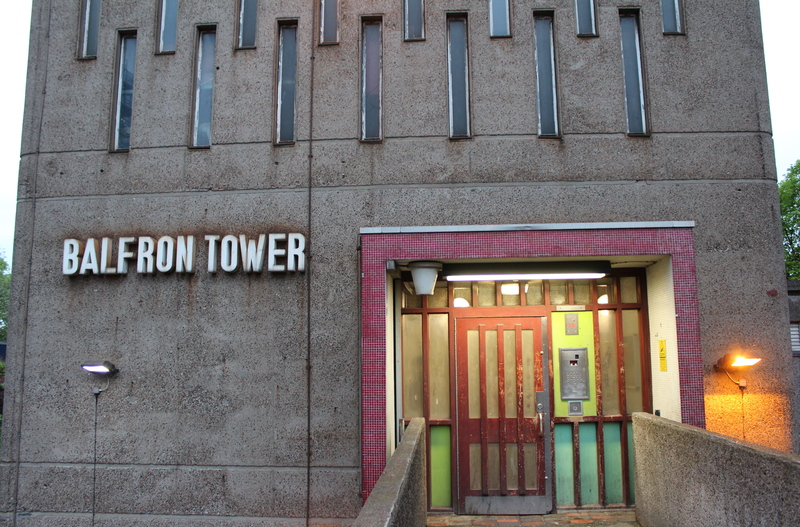 This entry was posted in Architecture, Guided tours and tagged 2 Willow Road, Balfron Tower, brutalist architecture, Erno Goldfinger, Simon Terrill, Trellick Tower by thelondonphile. Bookmark the permalink. 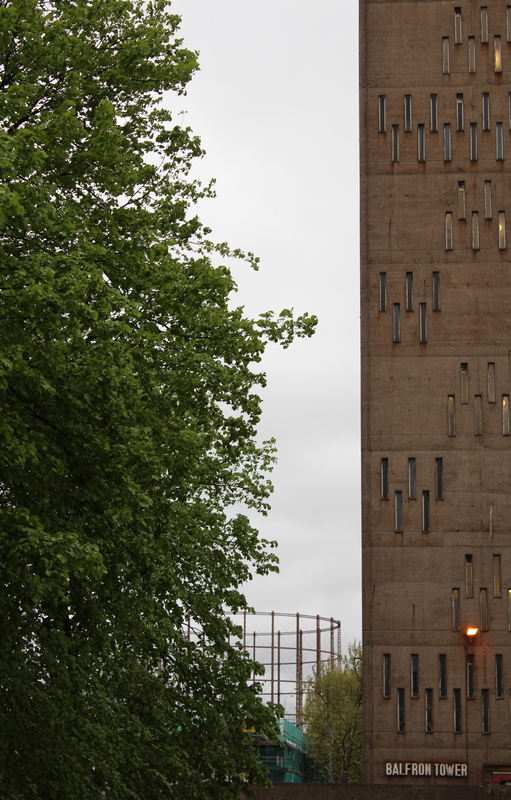 Balfron Tower – worth hitting the south bound Blackwall tunnel traffic jam for … Thanks for the tour. Now I can enjoy it even in free-flowing traffic! Glad you enjoyed it, thank you! I highly recommend getting inside the fortress if you ever get a chance. Great to see (and read) a tour of this iconic building. Must go during Open House! Yes it was great to get an opportunity to go inside! Am looking forward to Open House – not sure what to aim for this year yet though. Visited today, Open House London, one bed flat on the 24th floor, loved the block, hope it will be restored to its former glory, but for social tenant’s as originally intended, not for huge profit by HARCA!